Russian tea-drinking, along with other Russian phenomena and articles, has long become a calling card of this country — an odd card, though what is on this card is not clear. On the one hand, very many people can describe equipment of Russian tea-drinking (samovar, pancakes, jam, lumps of sugar, lemon, tea glasses in glass-holders, etc.). But at the same time very few people do drink tea in accordance with this description. I would even take the liberty of saying that the number of people drinking tea in accordance to the widely spread notion of Russian tea-drinking is negligible. 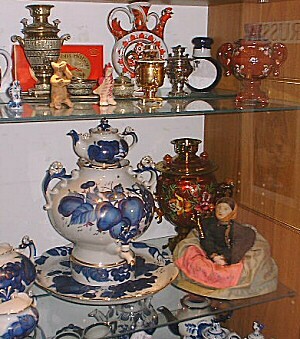 It is so at least because almost no one uses samovars nowadays. It is odd. Tradition we have — but a dead tradition, no one uses it, no one preserves it, and no one develops it. Of course, I am not able to bring it back to life, but I will try to formulate some features of tea drinking which can be classified as specifically Russian. For Russian tea-drinking one needs a porcelain tea set. Russian classic tea service is the ‘Cobalt grid’ of Lomonosov Porcelain Works. Such services are often sold in duty free shops of international airports of the Russian Federation and in the numerous souvenir shops. I do not consider Cobalt grid a good tea service — in particular, I do not like the ‘squiggly’ tea cups and the very ‘pushing’ coloring. But classical is classical — thus, let’s consider Cobalt grid the ideal service for Russian tea-drinking (this ideality is not categorical — you may use tea sets of any other colorings). Contrary to the widespread belief, tea-glasses are not good for Russian tea-drinking — even the ones in the most luxurious glass-holders. First, they are not handy. Second, respectable Russian houses rejected glasses as early as in the reign of Catherine the Great. Glasses remained the main tea implements in poorer and unsettled (e.g. bachelors’) houses — those people who understood the sense of both life and tea-drinking preferred porcelain tea sets. A peculiar feature of Russian tea-drinking is diluting tea-brew with hot water in the cup already. In other tea traditions (Chinese, Japanese, and English) tea is often not diluted but poured out directly from a tea pot and drunk. 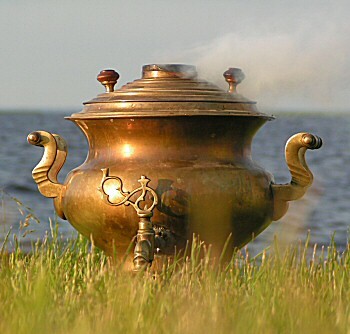 In Russia, it is almost always diluted with water — that is why besides standard tea things, a hot water vessel is employed in Russian tea-drinking. In former times, samovars perfectly performed this function. Nowadays, hot water can be added right from the kettle, but it is better (and more elegant) to use a special big ‘fill-up’ vessel. When tea is brewed, pour boiled water into the ‘fill-up’ thingy, and then pour water into cups from it. Probably, it is not as self-evident as pouring water from the kettle itself, but it is exquisite and ultimately more convenient. Russian exposition in Bramah Tea & Coffee Museum. The next important component of Russian tea-drinking is lemon. Simple and banal as it is, thinly sliced (cut into round slices, not into segments — rounds are nicer and look better both on a saucer and in a cup). As I have already said somewhere before, the whole world considers tea with lemon a Russian invention — this combination is often referred to as ‘Russian tea’. Thus, lemon is a necessary attribute of the Russian tea table. Another important characteristic of Russian tea-drinking is tea which will be brewed and drunk. It is not all that simple as it may seem. Of course, tea must be black (they used to drink different teas in Russia — green, black, and yellow, but today’s Russian tea taste is absolutely ‘black’). The question is what kind of black tea should be used. If historical justice is primary for you, then you should drink Chinese tea. For example, Keemun tea or some blend based on it (e.g. Russian Caravan, which is almost impossible to find in Russia). Chinese teas were drunk in Russia during three centuries — only the 20th century has changed tea taste of the Russians. Dramatically. At present, most Russians prefer rich and strong taste of Ceylon teas (at a pinch — Indian teas) to subtle and exquisite flavor of teas from China. So, if you want to be in line with contemporary Russian tea taste — brew strong Ceylon tea. Or better brew both of them. Porcelain tea service, ‘fill-up’ vessel, lemon, and Chinese or Ceylon tea are requisites of Russian tea-drinking. All the rest is decoration. But since it is decoration that makes us happy, let me say some words about it. First, samovar. If you are happy enough to get an antique or modern (they are still produced in Tula) wood-heated samovar and make it work — your tea table will be magnificent. Even an electric samovar (although, I do not like them) can adorn the table and change the atmosphere of tea-drinking. Second, jam. Strawberry jam, cherry jam, and whortleberry jam. And blackberry jam. Cranberry jam. Raspberry jam. And cloudberry jam — although there are many. And honey. And something to spread these jams on. Pancakes, for example. Crepes. And condensed milk (without the vegetable oil additive — only milk and sugar, carefully study labels). If you can gather all of these on your table, together with samovar, it will be luxurious. Third, pies. Real yeast dough pies. Fresh-baked. With cottage cheese, cabbage, apples, and other fillings — to your liking. Of course, pies must be baked in the same house where tea is served. When you have a hundred-year-old samovar, full of boiling water, porcelain tea set, two tea-pots (with Chinese and Ceylon teas), a dish with a pile of pancakes, one huge pie, and a couple of smaller ones, several kinds of jam, honey, condensed milk, slices of lemon, sugar (for sweet-teeth) — all on your table, you will understand what Russian genuine happiness is. And then you will eat it and drink it.